Lightweight, versatile and easy to launch: our Stabicraft 1650 Fisher giveaway boat. The Kingfish couldn’t get enough of the Sebile Stick Shadd. Mahi mahi were a welcome bycatch. This dolphin fish loved the Lumo pattern. The "other" dolphin fish. Don't try to catch these. Three, two, one – liftoff! You too could be chasing these in our Stabicraft 1650 Fisher giveaway boat. Scroll down to see how to win. 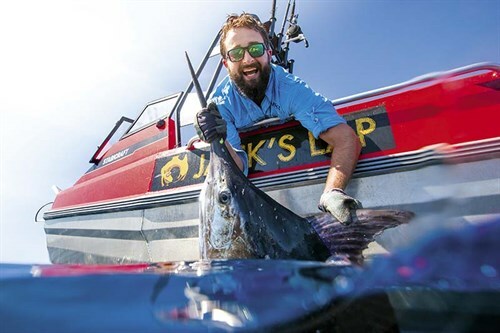 Our intrepid adventurer has the best fight of his life after fishing for black marlin just off the NSW coast aboard the Stabicraft 1650 Fisher giveaway boat. 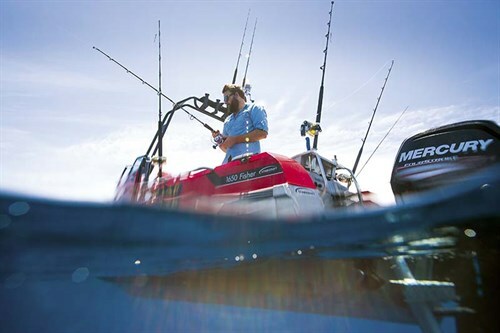 When we last spoke, I was fishing the 28th Lizard Island Black Marlin Classic in tropical north Queensland on our Stabicraft 1650 Fisher giveaway boat. 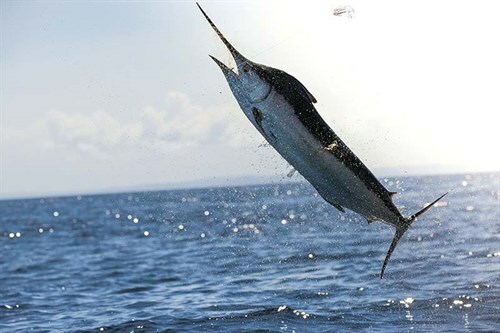 Although the 1000lb marlin (or any marlin for that matter) wouldn’t play ball, the Spanish mackerel, mack tuna, coral trout and cobia certainly did. So with my billfish itch still in need of scratching, I pulled up stumps in tropical Queensland and followed the East Australian Current back down the coast. I’d spent more than six weeks up in north Queensland and enjoyed fresh fish every second day. Would my salt-crusted beard be welcomed back into society for some decidedly less tropical fishing in NSW? I wasn’t sure, but nevertheless, I hooked up the Transtyle trailer with the Stabicraft 1650 Fisher atop and made the journey back to the NSW fishing ground – my home turf. 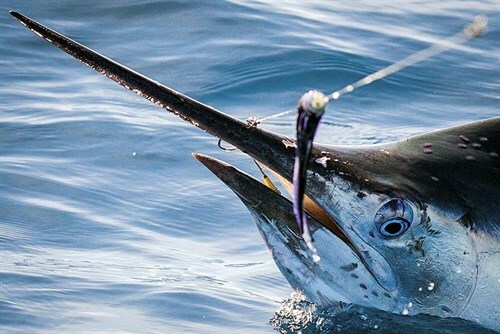 I returned to some promising NSW fishing reports and plenty of warm water flooding in just a few nautical miles offshore, so things were certainly looking good on the marlin fishing front. Even so, I should point out that, while the Stabicraft 1650 Fisher giveaway boat is more than an offshore-capable aluminium fishing boat, there’s no denying that it’s still a small boat. Without outriggers, game fishing on our Stabicraft was going to be tricky. Luckily, the predicted conditions for the next few days looked good. A quick phone around resulted in some awesome fishing reports about where the fish were and what they were feeding on. I flicked a text to good mate and game fishing tragic, Les Fox, and told him we were fishing for marlin. The very next day we were cruising east out of Broken Bay, NSW with our Stabicraft 1650 Fisher. Like what you see? You could win the Stabicraft 1650 Fisher featured here, plus a 2015 Majestic Sierra Xtreme off-road caravan worth a cool $57,990. The Ultimate Adventures giveaway package is worth more than $100,000. Find out how to enter. As the sun exploded from above the morning cloud cover, streaky golden rays sprinkled the horizon. The ocean was flat and the wind non-existent – today was definitely the day. Our first stop for the morning was the Broken Bay FAD (Fish Aggregating Device), where we set a spread of three Pakula skirted lures and trolled until a little mahi mahi woke us up with a squeal of the ratchet. We reset the lures and followed our noses to the next spot. A few hours down the track and we were seriously struggling to keep the lures in the water without a pack of mahi mahi annihilating our spread. The decision was made to have a break from trolling and pull up on some good jigging grounds we’d found earlier in the day. After catching one kingfish, we noticed the whole school had followed him back to the boat and were seriously aggressive. So aggressive in fact, that we couldn’t resist stripping down to our trusty Bonds undies and jumping in to photograph the school. It was pretty surreal watching these amazing fish chase around our Sebile Stick Shadds right in front of our noses. After catching and releasing more kingfish than we could handle, we threw the lures back out and kept trolling. Les decided he wanted to add a fourth lure to our spread and picked out a tiny Pakula Fluzi (a lure which looked more suitable for a big trout or an Aussie salmon than a marlin). He clipped it onto a spinning outfit and set it a couple of hundred metres back behind the spread. To punish him for putting out such a silly looking lure, I decided to drive past all the fish traps I could find, which in turn would result in a little mahi mahi grabbing his tiny lure every time. After reeling in more mahi mahi than one man could bear, he cursed me as I drove past another trap. On cue, the rod buckled, but this time it took a lot more line than previously and Les struggled to lift it out of the rod holder. A black marlin of around 60kg then appeared 400m behind the boat, shaking its head in anger with that tiny little Fluzi hanging out of its mouth – I’ll be damned! Using light line and with his fish tail-wrapped for half the fight, Les fought the stubborn black marlin for about 45 minutes until we grabbed the leader and set him free. After the obligatory high fives and a quick team debrief, Les got us back on the troll while I reset the lines. Of course, I put the little Fluzi straight back out to the shotgun position. Next, I fed out a Pakula Phantom on the long corner, and a few seconds after I clicked the 30W reel into gear, another 60kg black marlin came flying out of the water with the Phantom skirt helicoptering into the air. The sheer volume of celebratory screaming and terrified laughter that came next is something that people fishing miles away would’ve heard. By far the most actively aerial marlin I’ve ever seen, this fish jumped more than 30 times before he finally came to the boat! That black marlin was without a doubt was the best fight I’ve ever had. In fact, I’ll even go so far as to say it was the best bloody day I’ve ever had… simply exhilarating! On that note, the east coast of Australia is now done and dusted. Check back regularly to follow the adventures of the Stabicraft 1650 giveaway boat. HAVE YOUR SAY: What’s the greatest fight you’ve ever had in your life? What was the species? What gear was it on? Where was it and what was the boat? Leave a comment below. See the full version of this story in Trade-A-Boat #462, February / March 2015. Why not subscribe today?